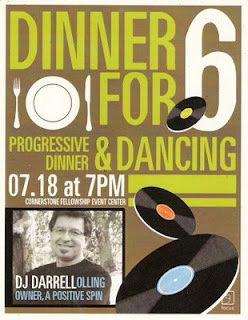 I'm doing final preparations for the "Dinner For Six", sponsored by Focus Singles at Cornerstone Fellowship in Livermore. Dinner music from 7-9 pm, followed by dancing from 9 pm to midnight. This flier was mailed to over 1,000 people! Thanks to Dave Matas and Paul Schaffer for setting this up!